How to teach a dog to like the crate? Best Crate for a big dog? 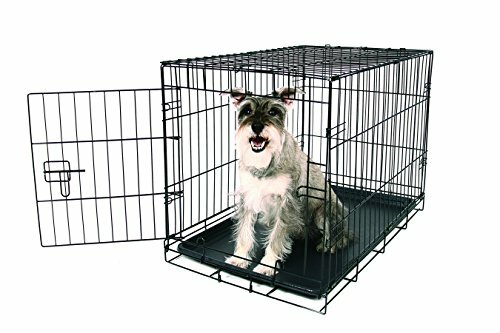 Best Crate for a small dog? There are many good reasons to consider purchasing a dog crate for your four-legged friend; such as for traveling, to give the dog a place where he or she can relax while at home, to be used in the car or when attending dog shows or other dog related activities. A dog can be crate trained to learn to love a crate, and it can quickly become their go-to place when they want some alone time. Pet crates come in a variety of sizes, shapes, and models, and what type works best for you and your dog depends entirely on what you plan to use it for. Remember to never shove your dog into a new crate and close the door, as it could traumatize them and stop them from ever wanting to use the crate again. Instead, leave the crate out with the door open, and let them explore it for a few days at their own pace. Read on for the full dog crate review & buying guide! This heavy duty dog crate is foldable for ultimate convenience, and it can easily be flattened and packed into the trunk of a car or stored with minimal space occupancy when not in use. This heavy duty metal pet crate comes in a variety of sizes so that you can pick the one that will best suit your dog, and it also comes in different colors and with one or two lockable doors. A durable slide-bolt door latch keeps the door securely closed, it only takes seconds to assemble it and it comes with a reassuring 1-year manufacturer’s warranty. Why We Liked It – A crate for dogs such as this top pick heavy duty dog crate is a great choice for someone who wants it to be portable and easy to bring with you. 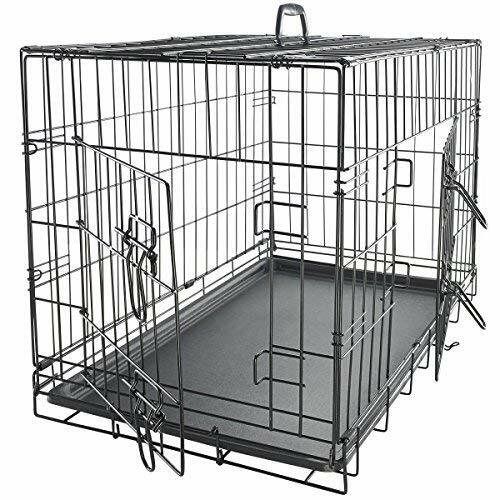 A solid crate takes up a lot of space, while this lightweight steel frame dog cage takes up virtually no space when folded! 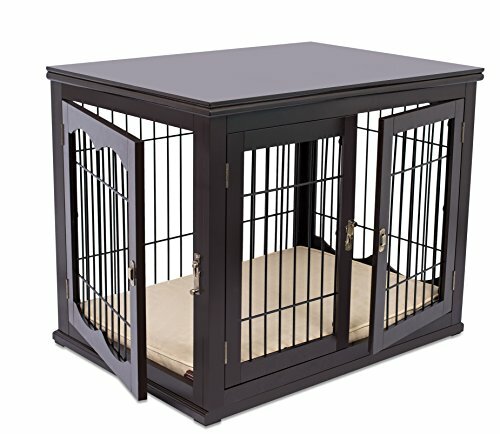 Looking for the best dog crate that will also look good in your home? This luxury dog crate looks like a small and classy wooden table, on which you can place personal items or flowers, and it works as a secure crate dog owners and different dog breeds alike will love. The tray at the bottom of the pet crate end table is removable for easy cleaning, and these are the types of dog crates you can buy that can unfold and turn into a gate! Use the gate to seal off rooms that your dog shouldn’t have access too; such as when people come over for a visit, and then use the simple assembly function to put it back in its place as a crate your pup can sleep comfortably in. Each panel can be removed to make the gate fit in just about any opening. 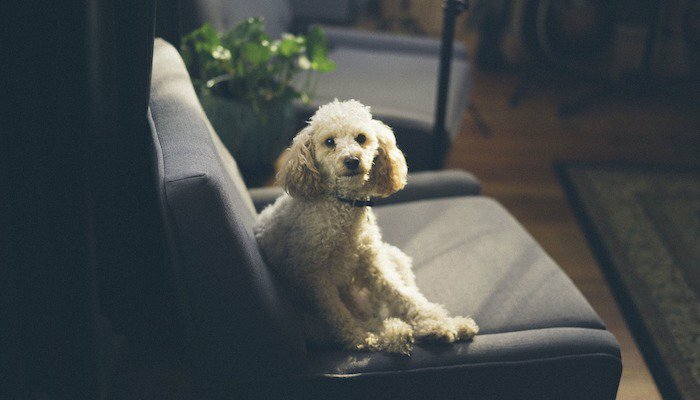 Why We Liked It – For dog owners, the house can quickly start looking like a dog’s house rather than a house where humans live, and while lots of people don’t mind – there are also those that would like to keep their house looking like it is not only inhabited by 4-legged individuals. These luxury dog crates will look great in any room, even when not in use by the dog. You could also try an Igloo dog house. 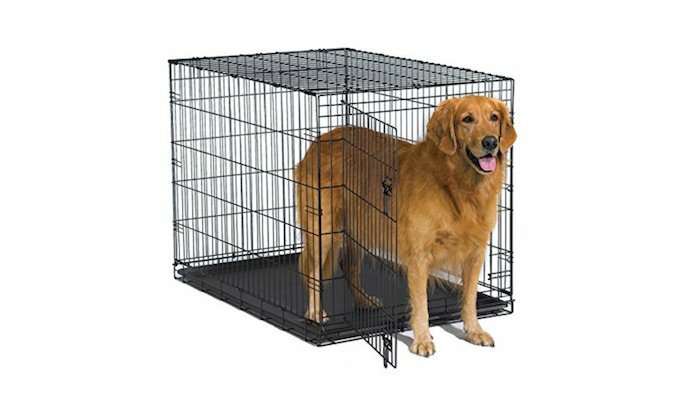 Amazon now has its own pet product available for those looking to purchase cages for dogs. It’s a metal folding crate with a removable tray, and it folds with a few simple actions. Store it away when not in use or when bringing it from one location and to another (such as on a train or bus where a solid crate would be too bulky to transport) and give your pup his or her very own secure location where they can hide away no matter where you are. 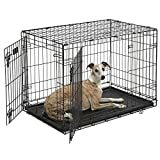 This AmazonBasics folding dog crate comes in several sizes, so that you can pick the best dog kennel for your dog, and you can choose if you want one with two doors or if one door is enough, plus there is an optional divider panel that can be used if needed. Why We Liked It – These affordable dog cages are perfect when first getting a dog, especially if getting a puppy. You can get the AmazonBasics folding dog crate in a size that will fit your adult dog and use the divider panel to gradually increase the space for a growing puppy. 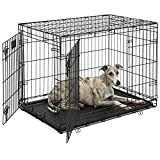 Buying growing puppy crates means you will have to replace them after a while, but with this AmazonBasics folding metal dog crate you can use the same crate though all life stages once your pup has been crate trained. Giving your dog his or her own space to rest and recharge batteries is invaluable, and something that will prove to be beneficial both for the dog and for the rest of your family. These types of crates are very easy to teach your dog to love since they have plenty of airflows and can seem less intimidating than solid plastic crates you can buy online. The door closes securely so that you can rest assured your dog won’t get out during transport or when needing to be in the crate, and you can fill it with blankets and soft bedding to make it as den-like as possible. Your best furry friend deserves a space that is only his or hers, so let the crate be an area where no children are allowed to play and where the dog is left alone to rest. Why We Liked It – Not all dogs feel comfortable being in enclosed spaces, and this kind of a steel frame dog cage allows the pup to feel like they are still a part of everything that goes on around them. The black e-coat finish gives it a discrete look that will go well with any room decoration. Whether you are looking for a medium dog crate, one for a miniature pup or the best dog crates for large dogs – this pet product has an option that will suit your needs. The steel bars are high-quality and will keep your fur baby inside, if that is what you need it to do, and the door locks with a secure bolt system. 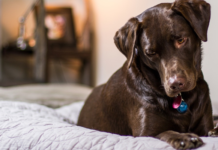 You can either choose to keep it out for your dog all the time or to use it for special occasions when you need to go somewhere or when you need your dog to stay in one place. Just make sure you get your dog used to it first, by allowing him or her to explore it a bit. Add soft padding to the removable tray for maximum comfort. dog crates is incredibly simple yet effective, and it will keep the door securely locked until you come back to open it. With a powder coated black finish – these dog crates for puppies and adults are as likely to appeal to you as they are to appeal to your dog. 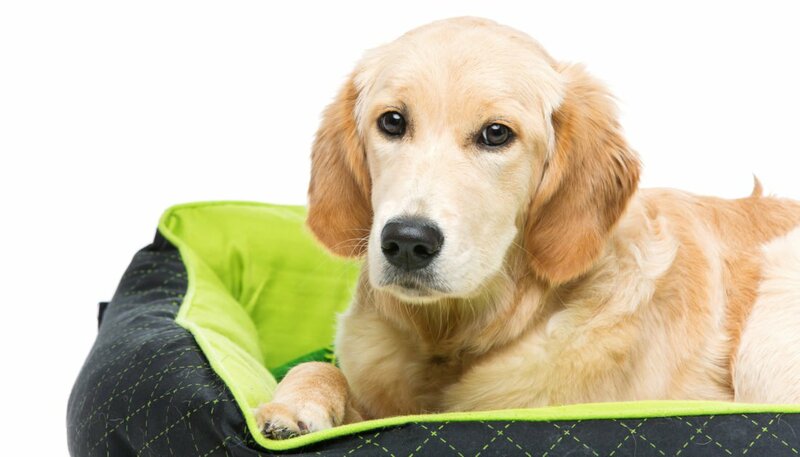 Plenty of airflow thanks to the steel wire design, blankets, and soft bedding can be added to the bottom and it gives your pup a place where he and she can relax. Don’t pet a dog that is in his or her crate, and instead give him/her a chance to feel that the crate is their space where they can go if they want to be left alone for a bit. The plastic tray can be removed from the cage without even opening the door and washed and/or scrubbed clean to eliminate the gathering of bacteria. The crate weighs 26lbs and is big and spacious in size. Why We Liked It – Finding the top dog crates for large dogs can be a challenge, but this steel frame crate for dogs has a size and durability to properly accommodate a bigger pup. Easy to clean since the tray can be removed even without opening the door. This double door folding wire crate for dog-owning families is made from heavy duty solid metal; often referred to as ‘steel’, and it is made to put up a good fight even when it comes to the most skilled escape artist! 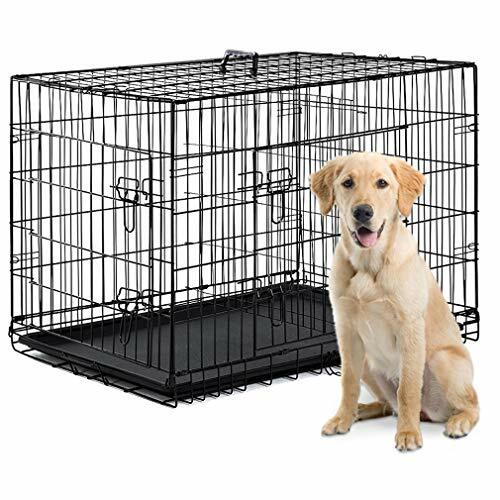 This double door folding wire crate will keep your pup locked inside when needed and serve as a great resting place for your dog the rest of the time. Just add blankets and comfortable bedding to make it the perfect little den and remove the bottom tray to clean the crate properly (should be done regularly). There are no tools needed to assemble this stylish black double door folding wire crate, and it folds flat and back up again in seconds. Another smart crates feature of this heavy-duty dog crate is the additional door – giving the crate a total of two large doors for your dog to go in and out of. 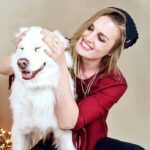 Why We Liked It – Some pet parents have little escape artists living at home, and for those individuals, it can be incredibly hard to settle on the best pet crate. This double door folding wire crate is made with that in mind and is reinforced to withstand most enthusiastic breakout attempts. Here we have a great soft-sided dog crate to use as den inside the house, for car travel and when wanting to contain your dog while visiting friends. They might not be the best crates for dogs to be left alone in since they could possibly chew their way out, but they are perfect for use when traveling by car or train with your dog, and as a comfy dog house back home. The largest size fits pets weighing up to 100lbs, and there are several smaller sizes to choose from for smaller pups as well. These also make the best puppy crates due to its soft material, and your new family members will feel right at home in no time. 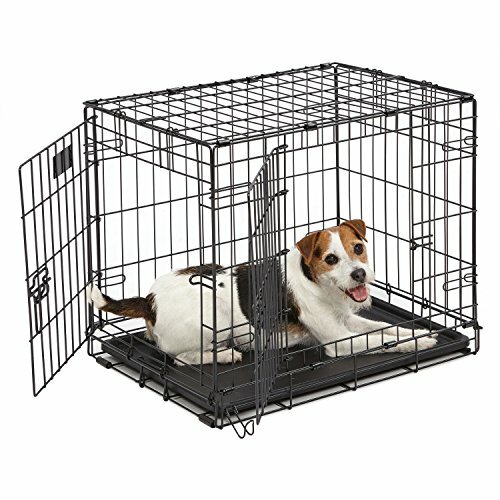 Good ventilation and a material that is easy to clean makes it one of the best dog crates for small dogs and big fellas. Why We Liked It – The best dog crates are those that your dog can feel comfortable in, and this cozy soft-sided dog crate has everything it needs to make your beloved pup as comfortable as possible. 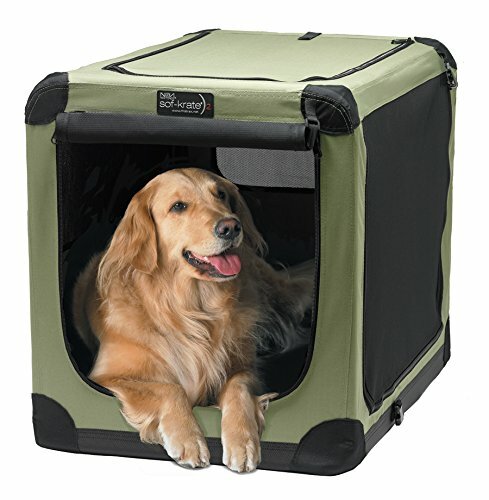 This soft-sided dog crate has no sharp edges and can easily be moved between rooms or taken along for a trip. An adorable wooden dog crate crafted from solid wood, with steel bars and a tabletop for placing items or decorations. This wooden dog crate is the perfect addition to a well-planned living space, as it will blend right in with existing furniture. 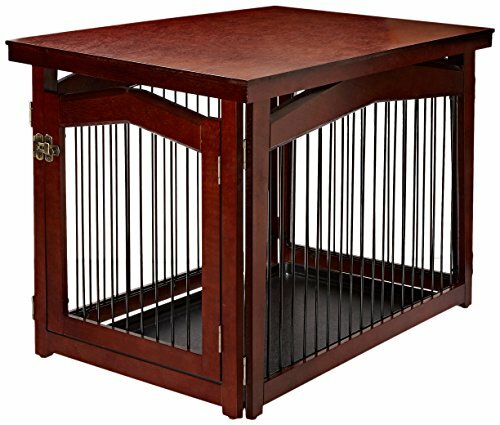 Dog crate reviews tend to list this product high due to its stylish and multi-functional design, and it will look great in your living room or wherever you choose to put it while also giving your dog a safe place to hang out. The two doors can be closed to lock the dog inside, but the crate is not chew-proof – so if you have a chewer on your hands, it might be a bad idea to leave them locked in there. Choose between a dark wooden color or fresh white, depending on what fits best with the decor of your casual home. Why We Liked It – Not everyone needs folding crates for their pups, and some prefer a solid crate for your dog that blends in with the rest of the décor. This wooden dog crate is made of solid wood, which adds the cherry on top to any room in the house. 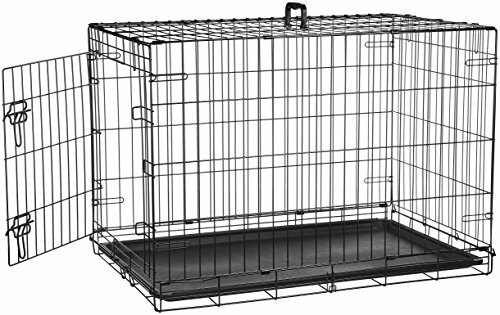 This soft-sided crate has mesh on three sides, to make sure the ventilation is good enough for your favorite fur friend to spend time there. Leave it open for the dog to go in and out at his own preference or use it to travel by car or on public transportation (if allowed). Leaving the dog unsupervised might not be advisable since it is not chew-proof, but it is one of the best crates for puppies and adults that just need a place to hang out. The mat is machine washable and easy to keep clean. Why We Liked It – When having dogs crates are essential items to have at home. 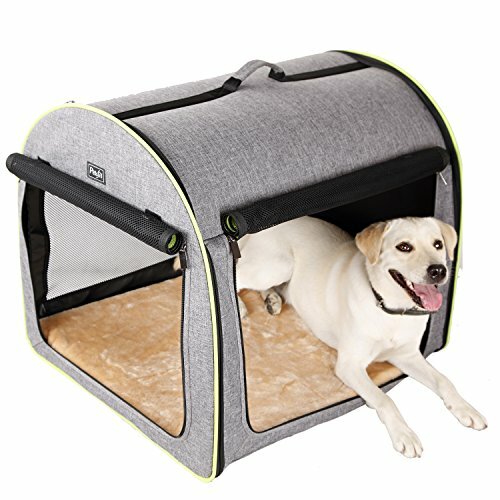 This soft-sided den-like crate gives your pup a cozy place to rest inside the house, and it can easily be brought along for car trips and more. Finding the best crate for dogs isn’t necessarily as hard as it might seem at first – and it all comes down to what you need and what you plan to use it for. Measure your dog properly to make sure you get the correct size and take a moment to think about what you need a crate to do and what functions you need. Perhaps you want a solid crate that stays put in one place, or on you can take with you when you travel? A great way to find the ultimate option is by checking out dog crates reviews and buyer opinions, but also to be clear on what it is that you are looking for already before starting the search. The best thing you can do is to compare fashion dog crates and read best dog crate reviews in order to find the best dog kennel in your household. There are many different types of crates, and you need to have an idea of whether you’re looking for the best small dog crate or a crate for a growing puppy, for example, to narrow down the options. Different crates are good for different things. A soft-sided crate for your dog is great for car travel, to keep open at home and to use when out and about, but not as great for keeping the dog in if nobody is there to supervise it. This is due to the material, since a dog could easily chew its way out, and in these cases, a foldable steel bar crate might be a better option. Another option is a furniture crate that is made of wood and that can be used as a coffee table or a furniture piece, while also giving your fur baby a perfect place to rest. Instead of having a crate take up space in the living room you are then choosing a furniture crate that also functions as a dog crate – a detail which the organized homeowner is bound to love! Keep in mind that many fashion dog crates are great for traveling, but that special rules apply for air travel, and that you need to read up on what the requirements are before choosing a crate for a plane trip/air travel. You usually need the best plastic dog crate on the market, since it needs to fulfill several safety requirements during air travel, and it cannot be foldable if you plan to take it on a plane. Other than that, it is mostly a question of need and taste when picking the best crate for a puppy- and adult dog families. If your dog is a chewer, you want to stay away from materials that he or she could chew their way out of; such as different types of dog crates fabric, wood and possibly even plastic dog crates. Instead, choose a sturdy steel crate, because while there are no guarantees and while no crate is completely escape-proof, it is a lot less likely that the dog will escape a steel crate compared to a soft-sided one. Plastic crates need to be BPA and toxin free, so keep an eye out for these types of dog crates certificates when shopping for plastic dog crates to make sure you are buying good dog crates. Most steel crates are similar in construction and material used, so just make sure you get a high-quality pet product where the bars are sturdy enough not to be bent or twisted. The best dog cages aren’t always the most expensive ones, and while a high price might sometimes indicate a higher quality – it is not a rule. Pay attention to crates features, function and reviews rather than the price tag, to avoid ending up paying more for something that doesn’t give you its money’s worth. It is important to allow the dog to get familiar with the crate before forcing him or her in there. The best way to do this is by introducing the crate inside the family home and place it on the ground with the door open with indestructible dog toys inside for a couple of days. That way the dog can go in and out as he or she pleases, and perhaps even choose to sleep in it! Don’t force the dog in and close the door, so if you plan to start using a crate for your dog – make sure you get it ahead of time to make the experience as pleasant as possible. Don’t forget to ensure their is plenty of food and water in the dog bowls. 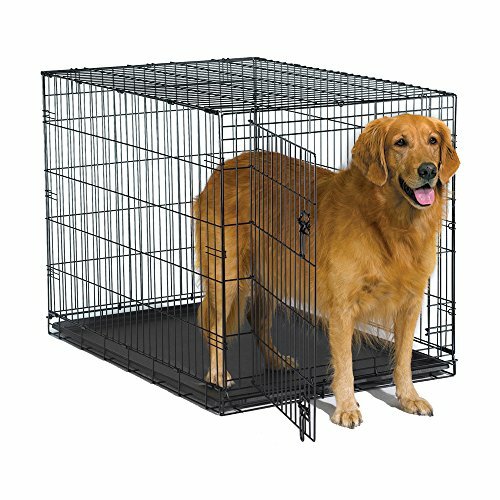 For big and powerful dogs, a steel crate like the ‘MidWest Homes for Pet Dogs Crate” is a great option, since it is lightweight but sturdy enough to keep a large dog inside. Why not get a great-looking crate like the ‘Internet’s Best Wood & Wire Dog Crate’ for a smaller pup? 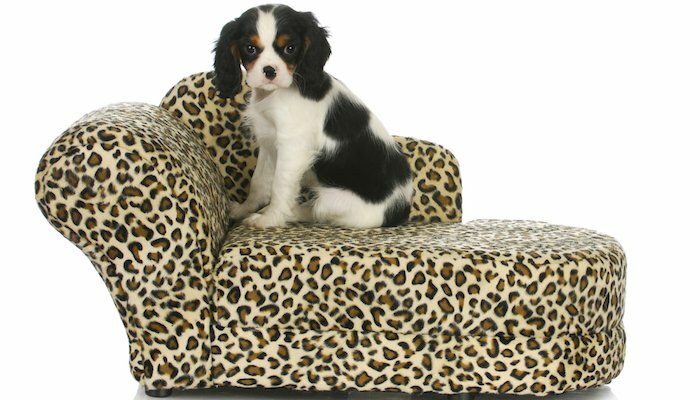 They are eye-catching and fits right into most homes, and small dogs are unlikely to chew their ways out of them. If looking for a portable crate – consider a soft-sided crate like the ‘Petsfit Soft Portable Dog Crate’. A sturdy and reliable crate is a great asset when raising a dog, regardless of whether you plan to keep the dog locked in the crate at some point, or if it is to be kept open at all times. 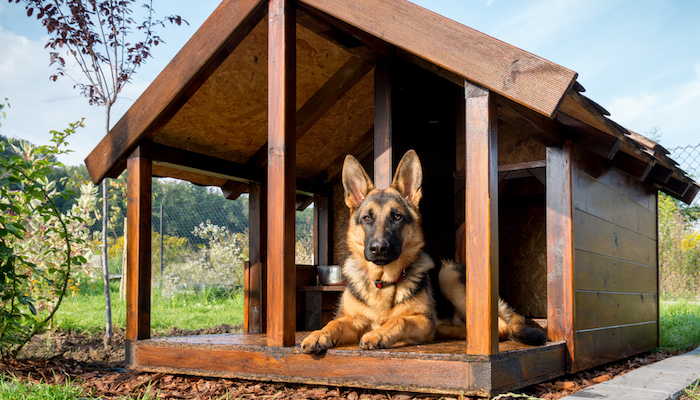 It is a safe space for a dog where he or she can go in when needing some alone time, which promotes a healthy behavior and a happy and well-balanced dog. Measuring your dog before purchasing a crate is incredibly important, and also to take it into consideration that your puppy might grow with time. Spare yourself the disappointment of having found the perfect dog crate, purchasing it and then having it arrive way too small for your furry family member. Dogs are very social animals and many love to spend time with their family, but they also need alone time and space to themselves, especially when there are younger children in the family. A crate can provide this, so make sure to tell kids in the family that when the dog is in the crate – nobody gets to go there and bother him or her. He or she will come out when ready to get back to playing. A crate can also help reduce separation anxiety mishaps such as ruined furniture.